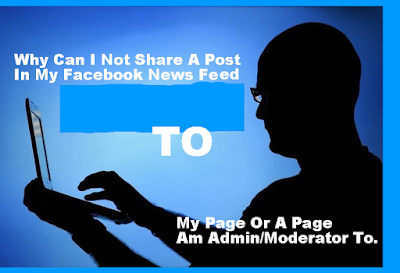 Why Can I Not Share A Post In My Facebook News Feed To My Page Or A Page Am Admin/Moderator To. The simple truth that you might be unable to share a Post in your Facebook Feed to a Page because Facebook post publicity policy is very strict. Here is what we mean. Any published to a page in Facebook is always visible to the public, and Facebook place a great importance on the privacy of their users. So if a post you see in your Facebook News Feed was shared to a specific group of people and not to the public, Facebook will prevent that post from being shared on a Page. That is exactly the reason why you might not be able to share some certain post you find/see in your News Feed to your Page or a Page you are an Admin/Moderator to. Will It Be Wise For Me To Re-share My Friend’s Facebook Status, Photos and Video Updates?